You know how every Christmas there’s that song that plays touting December as the most wonderful time of the year? As much as I love Christmas, every summer about this time that song starts creeping into my head. Not because I’m anticipating the steadily approaching holidays, but because one of my favorite TV shows returns: The Great British Bake Off. This year, for Series 5, they’ve actually moved the show to BBC One, which means a lot more exposure, and a lot more excitement! In the first year I started this blog, I challenged myself to try one bake from each of the episodes in order to grow my skills and try my hand at some of the challenges in hopes of auditioning for GBBO. It worked well then, (I got as far as the audition round) so I figured I’d give it another shot. Plus, it’s more motivation to keep baking each weekend (as if planning an international wedding wasn’t enough to keep me busy! Only 61 days to go!). The first episode of the show focused on cakes, a relatively simple category, but it really allowed us to focus on meeting the new bakers this year. There are a few that I think have amazing talent, but one of them drives me absolutely up the wall! He is the most obnoxious person I could imagine meeting. I’m hoping he gets kicked off soon! Fingers crossed! 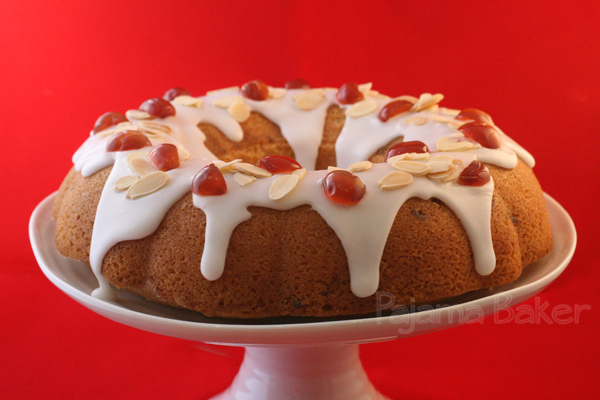 The technical challenge for the episode was to make Mary Berry’s Cherry Cake, an almond-flavoured sponge with bits of cherries distributed throughout the cake. The trick to putting the cherries in is to chop them into smaller pieces, then rinse, dry, and coat with flour. This helps the cherries “float” in the batter so that they don’t all sink to the bottom of the tin (eventually the top of your cake). This cake was super easy to make, although it didn’t rise as much as I would have expected, so I may double the recipe next time so that it makes more of a statement on the plate! Now before you start wondering about the crooked-looking cake, it’s actually my new cake stand, which was given to me as a bridal shower gift by one of my bridesmaids, Kelsie. It’s absolutely beautiful and I love that it has that quirky, not exactly perfect appearance. It just adds to the handmade nature of what’s being presented on it. After getting this stand, I found out they do it in two other sizes and heights, so I’m definitely adding those to my wishlist! 1. Preheat oven to 350° F (approx 175°C). Grease a bundt pan and set aside. 2. Cut all of your cherries into quarters, then rinse them under cold water so they aren’t sticky and turn them out onto some paper towels to dry. Make sure you set aside 5 of your cherries for the topping. Toss the rest of the cherries in your 2 Tablespoons of flour so that they’re evenly coated. 3. In your mixer, cream the butter and sugar until light and fluffy, then add in your eggs one at a time. Once mixed, add in your flour and ground almonds and mix in thoroughly. Remove your bowl from your mixer and fold in your flour-coated cherries and lemon zest by hand. 4. Pour your batter into you greased pan and bake for 35-40 minutes, until your cake tester comes out clean and the top is a lovely golden color. 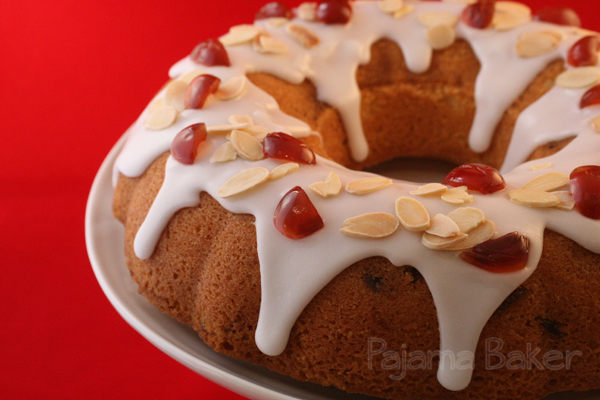 Let your cake cool in the pan for 10 minutes, then turn it out onto a wire rack to cool completely. 5. To make your icing, gradually add the lemon juice to your icing sugar so that it makes a thick paste. Carefully drip the icing over the top of the cake using a spoon. You want the icing to run down the sides a bit, but not completely coat the cake, so you’ll need it to be pretty thick. 6. 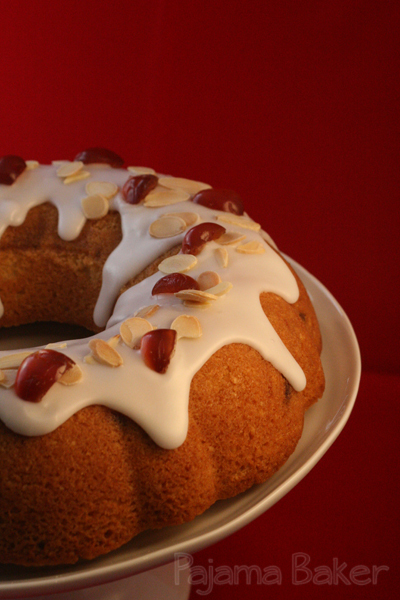 Finally, top your cake with the toasted flaked almonds and your cherry bits. My name’s Dave and I’m lucky…along with 35 of my colleagues! Why? Because the amazing Ashley brings into the office her fabulous baked creations. I had a small bowl of cereal today for breakfast and I knew that was never going to cut it! 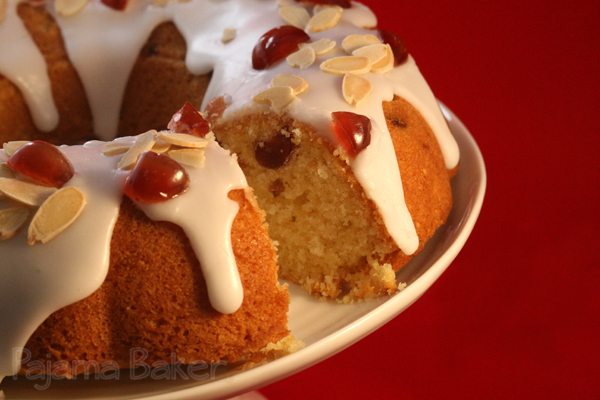 However, Mary Berry’s Cherry Cake bloody well will. Utterly perfect in every way. Thank you Ashley…cake on Monday morning?…how very continental!! Gym tonight methinks!! Thanks so much Dave! I’m glad to share my bakes! Lord knows I can’t be eating all of it! This cake is so beautiful! These pictures rock and the cake looks too good to even eat! Thank you! Sadly, the cake was not long for this world! My office ate it in minutes!